Normally I like to prepare carefully in advance before testing out a new ski area, but today I went with a hunch that I might be able to score some good skibiking at the Massif des Brasses and luckily my senses proved correct. It is located in an area referred to locally as the Valley Vert (Green Valley), the name is well chosen, for this isn't a deep barren wintry gorge but an area of wooded rolling countryside with steeper hills at the edges. It reminded me strongly of the area between Pitlochry and the Spittal of Glenshee in Scotland's Cairngorm mountains. There was plenty of "big sky" and charming little villages, where farming is still the main money spinner and tourism pays for the luxuries. all very down to earth and Gallic. In spite of cut price competition from multinational corporate supermarkets, the villages have retained their; local bakers, confectioners and butchers. Incidentally the bakers are always worth a visit for a delicious pain au raisin (sweet raisin bread laced with gooey custard) or pain aux noix (a savoury bread made with walnuts). Both make superb components for the perfect brunch time belly filler. It was an easy and quick drive out from Geneva, practically flat by local standards, with the last couple of kilometres a bit steeper and more twisty. I found it hard to believe there would be a resort open given the lack of snow on the verges of the road. Passing through Bogeve I spotted the signs for the ski station and followed them. I was expecting to see a tiny village, with a 100m hill above it, served by 2 drag lifts, a red and green run, plus a nursery slope served by a rope tow lift; a bit like the French provincial equivalent of your average British dry ski slope. Upon arrival my first impressions were that it was exactly that. However, the chairlift went much higher than I was expecting, following a tiny stream through the woods up to the sunny peak of the Pointe des Brasses. 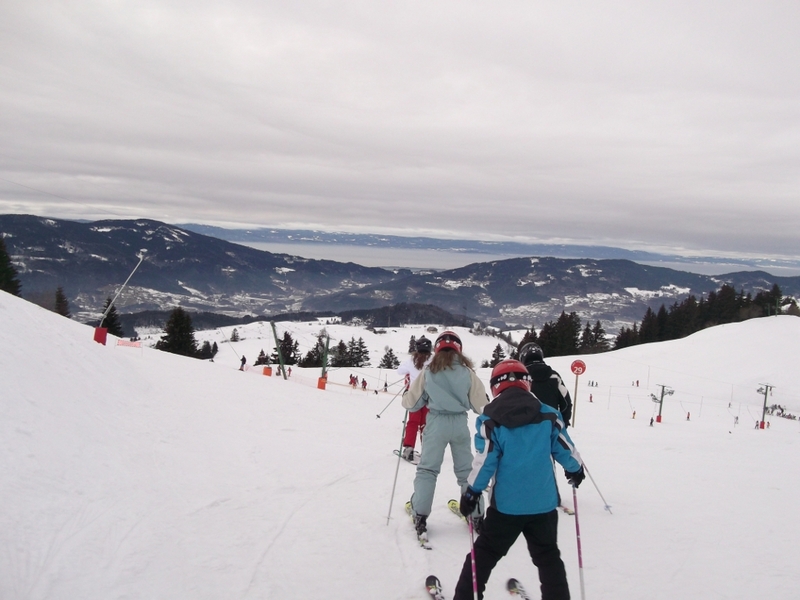 Here learners get their first runs and more experienced snow users can head off in different directions, meanwhile others just chill out on a sundeck, or eat and drink the day away at the restaurant. The top station is stated as being at 1600m, this is low altitude by Alpine standards where the sun this far South can melt away snowfall on any given month. But for today, in late February, the result was pleasant soft rideable snow, not the killer ice I had experienced just a short distance away a few days earlier. The downside is that the ski season at the Massif des Brasses is likely to be short. The upside, is that there is plentiful woodland riding on offer; being up on a glacier above 3000m is all very macho, but there is a lot to be said for whizzing through the woods. The infrastructure is mostly based around chairlifts complemented by a handful of interlinking Poma drag lifts. Most chairlifts are small, vintage 2 and 3 seater non detachable types. Providing the lifties are on the ball they will slow them down for you, so it isn't quite so painful on re-entry. Won't be an issue Brenter type skibob riders, more for the novice pegger freestyle skibike method followers. The lifties have become accustomed to SnowScoot riders and are on the ball and friendly. The price at 21€ was excellent value, confirmed during a chat with a local, who much prefers prefers to bring his kids to the ESF ski school rather than pay big resort or worse, Swiss prices. The runs are easy by Alpine standards, you are on big rounded hills, rather than craggy mountains, the riding is steep enough, I hit an icy bare patch and was surprised quite how far I slid on my back before stopping. 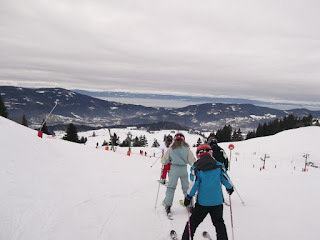 In summary the Massif des Brasses offers fun, cheap, unpretentious skibiking when conditions allow. It is an easy drive from Geneva, almost in the Southern suburbs. You could fly cheaply from the UK on EasyJet, grab a hire car and be there in an hour. You would be unlikely to need chains except during a blizzard or immediately after heavy snow. I recommend you head for the Chenevieres chairlift above the curiously named village of Onnion, there you will find a modern detachable chairlift, so the take off and landings are very slow and safe. 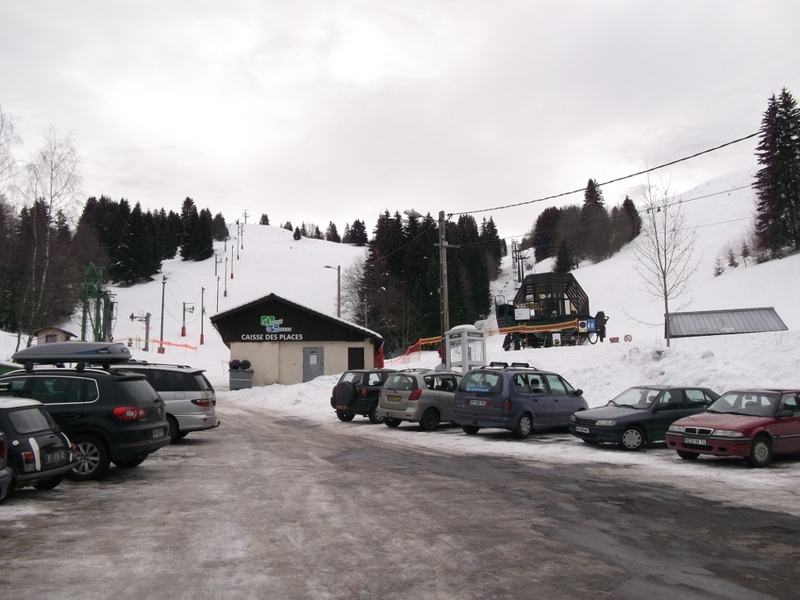 You can also go to the main car park at Chaine d'Or, above the village of Bogeve, from here you can skibike for 3 minutes down an easy blue to the same chairlift. There might be local bus and coach services, choices might be very limited though.